Thick & Hearty Steak SauceA. 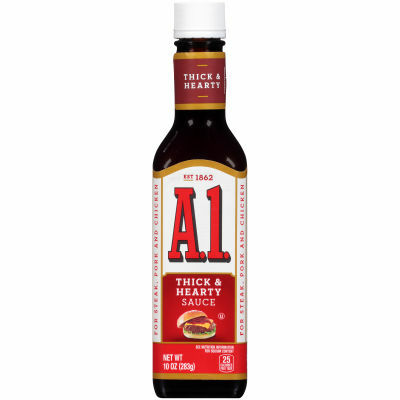 1. has got the finest Steak sauce to complement all kinds of burgers and steaks. A.1. Thick & Hearty Steak Sauce brings you a blend of sweet, sour and salty flavors, that's bound to take your burger or steak from a meal to an enticing indulgence. Sweet, Sour & Salty!A.1. Thick & Hearty Steak Sauce is a delectably tempting blend of premium quality ingredients such as, tomato puree, vinegar, salt, raisin paste, crushed orange puree, spice, dried onion, and dried garlic. These ingredients simmered & blended to a tasteful sauce; tantalize your taste buds with the tangy, zesty, a little sweet & little spicy lip smacking flavors.